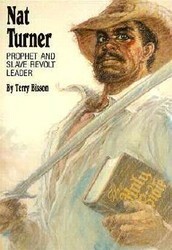 Nat Turner was an African American slave born in Southampton County, Virginia. Although a reward notice described him as "rather bright," he was not a mulatto. Turner learned to read and write at a very early age, and was deeply religious. At the age of 21, Turner ran away from his master, but returned a month later after becoming delirious and having a vision telling him to return to his master. Turner experienced many visions, which he viewed as messages from God, and also preached to his fellow slaves. The other slaves gave him the nickname, "the Prophet." 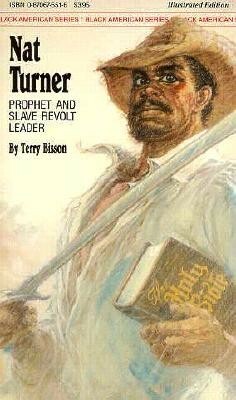 On August 21, 1831, Nat Turner gathered more than 70 slaves and free blacks to lead a rebellion, traveling from house to house, freeing slaves, and killing every white person they encountered. Before the rebellion was suppressed, Turner's group had killed an estimated 60 men, women, and children. In retaliation, white militias were organized in the surrounding area, and between 100 and 200 blacks were murdered. In the aftermath, 48 blacks were charged with conspiracy and 56 blacks were executed. After evading capture for two months, Nat Turner was tried and hanged. 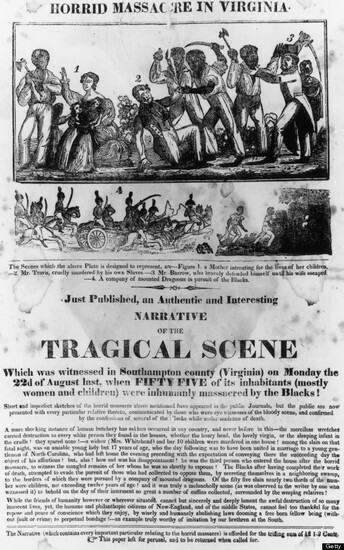 Created by a white person following the rebellion, this image portrayed the blacks as savages, and failing to mention that nearly 200 blacks were murdered in retaliation for the rebellion.